If you ever wanted to know how to make flower pens, look no farther. I’ll show you how to make this fun craft today! DIY flower pens are easy to make and make fantastic homemade gifts! It’s so quick and easy to make your own flower pens, you can have a pile in no time. They’re easy enough for kids to help too! With Mother’s Day just around the corner, these DIY flower pens are a perfect gift for Mom or grandma. They’re adorable given with a kitchen notepad for Grandma’s grocery lists too! The more pens we made the more possibilities we came up with. Grab a ribbon and tie the flower pen to a cute journal for a fun party favor. How about paired with a box of stationary for a tween gift? Put several different colored flower pens in a vase for your teacher. Who wouldn’t want one of these adorable flower pens? I want one for my desk! I recommend buying a lot of flowers and pens, because I guarantee that you’ll want to make a bunch of these flower pens once you get started! – for the best selection, check out your local craft store or Etsy. Your ballpoint pen should look like the following photo. Remove the cap and the plastic cap from both ends of the pen. Save the pen cap, but discard the plastic end piece. Sometimes you can pry the end cap off neatly, but if it is difficult, cut it off with a pair of sharp scissors. Since the floral tape and flower will cover the end, it won’t matter if it cracks or is broken on the end. Wrap floral tape from the top of the pen all the way down to the writing point of the pen, then replace the pen’s cap. Your artificial flower should have a stem like the following photo. If your flower has a long stem, cut it to about 1/2 an inch long. Put a generous drop of glue in the top of the pen, where the plastic end cap used to be. 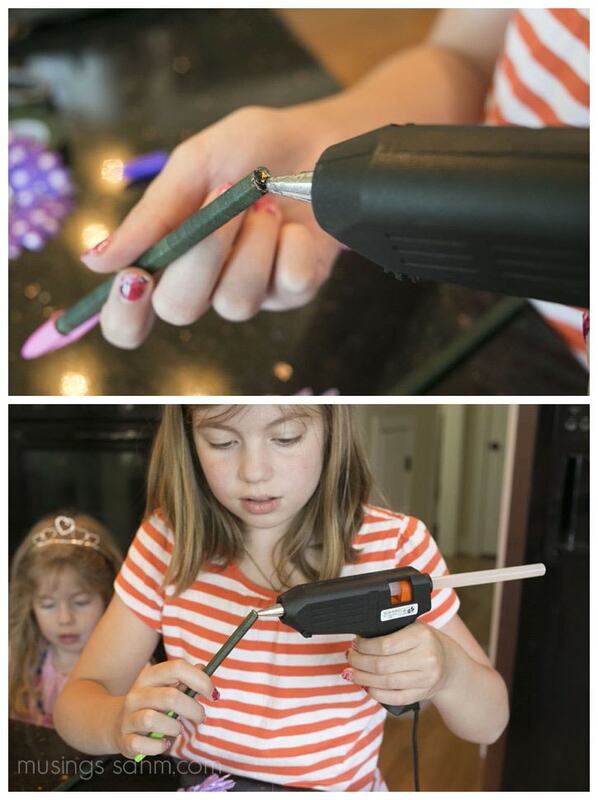 You can use your favorite craft glue, super glue, or a hot glue gun. Stick the artificial flower stem down into the pen. There you go. And that’s how to make flower pens! 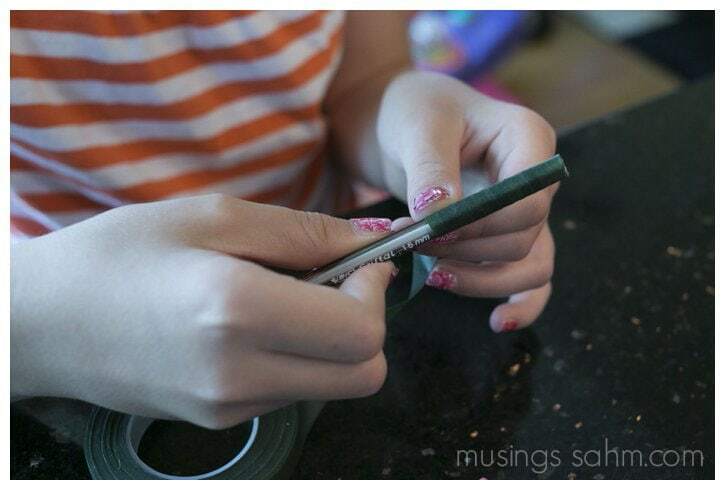 My daughter and I cannot wait to make more of these pens for gifts! In spite of all our great giveaway plans, we put our flower pens in a vase on the school desk. They really brighten up the space and are so much fun to write with! Will you keep your homemade flower pens or give them away? Definitely adorable pen flowers! And so easy to make too! They make an excellent centerpiece and then you never have to hunt for a pent again! I love crafts I can actually make! This is so cute. My daughter would love making these, which I think I’ll pick supplies up and do them for my mom! Our doctor’s office has these and my girls always want to take one. Now they can make their own! Those are incredible and so crafty!! My daughter would love making these! I love these pens but….. I made a bunch and not they’re not writing. I am wondering if it’s because the hot glue got in to the ink chamber maybe? Any suggestions? I have seen that some people leave the cap on and wrap the flower on the side with the floral tape. The hot glue is just so easy. But I gave these as gifts (and made some for myself too!) but mine aren’t writing right now and I’m hoping that didn’t happen to theirs. Let me know if you’ve experienced this and if you have any suggestions. I see this is an old post, but I had the same problem. The pens worked before I hot glued the flower on top. I also believe it was due to the glue getting into the ink chamber. I have the same problem. I believe it maybe due to the air chamber becoming clogged with the glue. In order for the ink to flow down, air must be able to flow upward in order to release more ink. I have a bunch of really cute pens that no longer work to write with, but look great as a flower arrangement. ;) I’m going to try experimenting and see what else I can come up with, because I don’t like putting the stem on the outside either. Personally, the floral tape is a little tacky to the touch, can come loose with a lot of use, and comes in limited colors. I love using duct tape instead. A piece approx 5 inches long is great for covering a single pen (apply vertically). Now scented duct tape is available. I love the bubble gum pink!! We had this happen with pens that were transformed into feather quills. We had to cut the tips off to make them work again. Where did you find the artificial flowers? I have the exact same question. I want to do this as the main craft at my daughter’s birthday party.. having a hard time finding the adorable and reasonably priced flower heads… any ideas? I found these at Michael’s. Do you have a craft store nearby? Good luck! I found these on Etsy! I have used different types of flowers. Not just daisies. Small roses, pansies, chrysanthemums. I also like others have have taped the stem ont outside of the pen. I just snip the stem shorter and hot glue it a little bit to help it stay in place better. So cute but impossible to get the ends off easily which really slows down this project. I’ve tried a knife, pliers, scissors . . . there must be an easier way! I’m so sorry it’s being stubborn for you, Tara. Amanda was one of my contributors (she has her own blog now) and she’s the one who did this project. I haven’t personally, so I can’t speak as to what works or doesn’t. My only suggestion would maybe be to try a different kind of pen? I hope you can make this work! They can be really difficult! I cut mine off with really strong scissors. Since the glue and tape covered the area, it wasn’t noticeable. Later I found that Pentel RSVP pens are the best, because they have a top that unscrews. I love your pen idea and really glad you posted the instructions. I was at one of our local hospitals in my community and they had these at all their desks. It was so unexpected to see and brightened up the place. People couldn’t help but comment. My granddaughters and I made bouquets of flower pens over the weekend. After making them we sealed the floral tape with sealer glue, like modge podge. Now the floral tape will not unravel.